Springtime is wonderful in South Central PA. Flowers are blooming, birds are singing, and if you listen closely, the musical dings of lead pounding steel echo through the countryside. That's right, it’s spring, and it’s time for the PSA Shootout. Held annually at the Palmyra Sportsmen’s Association, the PSA Shootout is the largest knock-down steel match in the country, bringing in nearly 600 shooters for an all-steel speed shooting match. 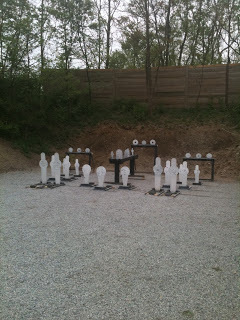 There are 6 stages, with 25-35 falling steel targets per stage. With approximately 180 plates, at 600 shooters... Yeah, that's well over 100,000 rounds downrange over the course of the 4-day event. The game is pretty simple: shoot all the plates until they are down, as fast as you can. There are 4 handgun divisions: Stock Auto (iron sights, no comps), Open Auto (optics, compensators, etc), Stock Revolver (iron sights, no comps), and Open Revolver (optics, comps, etc). Shooters can enter multiple divisions with different guns. Automatics are downloaded to 10 rounds in a magazine, and revolvers are limited to 6 shots before a reload. The start position is either holstered, or gun in hand with the muzzle touching the table, and reloads can be done off your belt, or the table. The stages contained large plates, spaced closely together for those clutch-dumping speed runs, along with just enough small plates so you had to slam on the brakes and really see that front sight. Someone in Texas must have read my post about the Star, and decided to teach me a lesson by stacking 2 stars on top of each other in Stage 1. Although my Beretta 92G Elite II ran flawlessly all day, the rest of my squad fought with an abundance of gun malfunctions. Failures to feed, fire, eject, and who knows what else seemed to pop up on every other run. At least one shooter had to break out the back up gun. This is one of those events where folks like to see how light they can load their ammo, but I try to stay away from the sub-power factor bunny fart loads. It might shoot soft, but it might also not cycle your gun reliably, or knock down the steel. 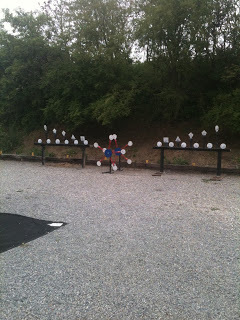 So next spring, if you’re looking to start your shooting season off with a bang, or a ding, try the PSA Shootout. You'll see some old friends, meet some new ones, and have a blast. Just bring your safe attitude, your favorite pistols, and ammo. Lots of ammo.